This paper is a study about the concept implementation of moderate Islam through democracy learning method in Islamic elementary school. The ease of internet access and remote communication, as the effect of globalization in the field of technology, can be used to gain any information needed, including the knowledge of religion that can be freely learned without teachers. This condition easily leads people to the wrong concept of religion, such as the appeal of jihad, suicide bomb attack, concept of martyrdom and simple ways to enter paradise. Consequently, there are many intolerant people who always try to influence others to join their community. Moderate Islam (tawasuth) is a life principle that uphold justice in social life. This concept can be internalized at school curriculum as a reinforcement started from elementary school level through implementing democracy as a learning method. Democracy gives students wide opportunities to creatively and critically express their idea in their own way. IMRON, Ali. Penguatan Islam Moderat melalui Metode Pembelajaran Demokrasi di MI. Edukasia Islamika: Jurnal Pendidikan Islam, [S.l. ], v. 3, n. 1, p. 1-19, june 2018. ISSN 2548-5822. 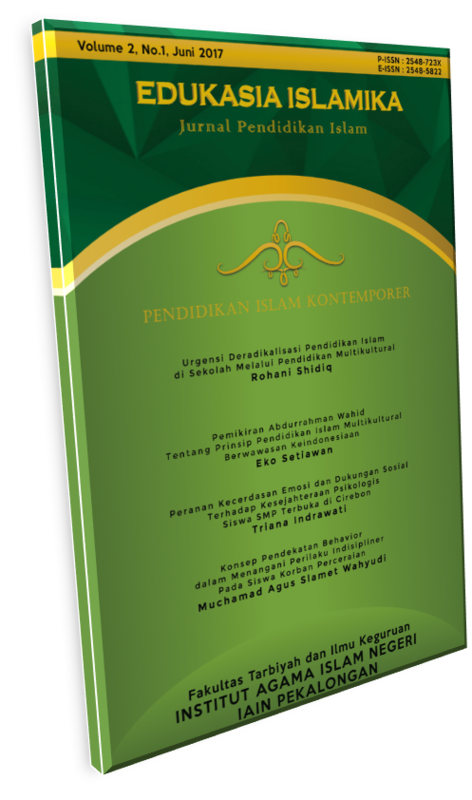 Available at: <http://e-journal.iainpekalongan.ac.id/index.php/edukasiaislamika/article/view/1298>. Date accessed: 22 apr. 2019. doi: https://doi.org/10.28918/jei.v3i1.1298.